The Fellowship was fortunate enough to obtain a copy of TURNING TIGER: SPECIAL EDITION from Renegade Arts Entertainment and Arcana Studios. Richmond Clements wrote the story and Alex Moore did the illustrations. The US Army is trying out their new secret project: three giant robots with advance weaponry. On their first test, one robot goes rogue and flies away. This robot, named Jen, seems interested in this one particular family…especially the pre-teen daughter Sarah. The project leaders promise Sarah’s parents that they will get their daughter back, but are hiding something. What is the secret do the general and professor have and is Sarah’s life in danger? If you are thinking this story is somewhat similar to the film IRON GIANT, you are right, but there is a twist. I won’t tell you what the twist is, but it definitely is a good one and I found it interesting. This great book will be enjoyable for any age. Moore’s art is very stylized and cartoony, but that’s OK. I love the action sequences with the robots. I can definitely see this as an enjoyable animated movie. 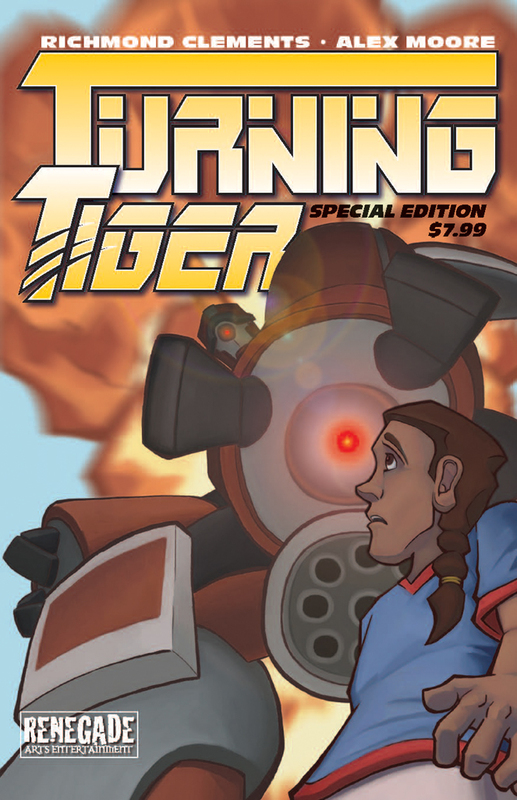 TURNING TIGER: SECIAL EDITION is out in stores now or available at www.arcana.com or www.renegadeartsentertainment.com.